People need a good reason to stop believing one thing and start believing something else. Let's pray for dissatisfaction with their current beliefs. Ask Go to reveal to them the shortcomings of their beliefs, so their hearts will be open for His truth. Jer 2:28 "But where are your gods Which you made for yourself? Let them arise, if they can save you In the time of your trouble;"
Lord, there is no other God besides You, a righteous God and a Savior; There is none except You. You are the only God that never disappoints, You are always faithful, and always true. I bring the Hindu Unreached Peoples of South Asia before you now, and I ask Lord that you would reveal the shortcomings of their gods. Challenge the impostors and show them to be silent idols. 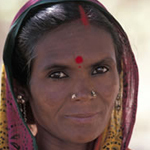 Lord, I ask for a demonstration so the Hindu Unreached Peoples of South Asia could see the impotence of their gods. Stir a deep disappointment in the hearts of the Hindu Unreached Peoples of South Asia and cause them to question their devotion, and worship. Wean them from their dependence on their gods, to make room in their hearts for You.